His Holiness Pope Benedict XVI gave the following homily at the Ordinary Public Consistory for the Creation of New Cardinals and for the Vote on Several Causes of Canonization, 19 February 2012. The great Chair is supported by the Fathers of the Church. The two Eastern masters, Saint John Chrysostom and Saint Athanasius, together with the Latins, Saint Ambrose and Saint Augustine, represent the whole of the tradition, and hence the richness of expression of the true faith of the holy and one Church. This aspect of the altar teaches us that love rests upon faith. Love collapses if man no longer trusts in God and disobeys him. Everything in the Church rests upon faith: the sacraments, the liturgy, evangelization, charity. Likewise the law and the Church’s authority rest upon faith. The Church is not self-regulating, she does not determine her own structure but receives it from the word of God, to which she listens in faith as she seeks to understand it and to live it. Within the ecclesial community, the Fathers of the Church fulfill the function of guaranteeing fidelity to sacred Scripture. They ensure that the Church receives reliable and solid exegesis, capable of forming with the Chair of Peter a stable and consistent whole. The sacred Scriptures, authoritatively interpreted by the Magisterium in the light of the Fathers, shed light upon the Church’s journey through time, providing her with a stable foundation amid the vicissitudes of history. After considering the various elements of the altar of the Chair, let us take a look at it in its entirety. We see that it is characterized by a twofold movement: ascending and descending. This is the reciprocity between faith and love. 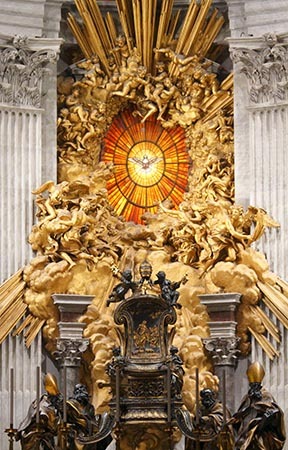 The Chair is placed in a prominent position in this place, because this is where Saint Peter’s tomb is located, but this too tends towards the love of God. Indeed, faith is oriented towards love. A selfish faith would be an unreal faith. Whoever believes in Jesus Christ and enters into the dynamic of love that finds its source in the Eucharist, discovers true joy and becomes capable in turn of living according to the logic this gift. True faith is illumined by love and leads towards love, leads on high, just as the altar of the Chair points upwards towards the luminous window, the glory of the Holy Spirit, which constitutes the true focus for the pilgrim’s gaze as he crosses the threshold of the Vatican Basilica. That window is given great prominence by the triumphant angels and the great golden rays, with a sense of overflowing fullness that expresses the richness of communion with God. God is not isolation, but glorious and joyful love, spreading outwards and radiant with light.